The Localvantia Merchant Bifold Brochure is a professional, full-color, classic “bi-fold” brochure designed for use with your pre-registered Localvantia Merchants. They are printed on 100 lb. glossy 6" x 8.5" stock, two-sided, then folded in half vertically to 3" x 8.5" to fit perfectly in a standard business envelope. Each unit ordered includes 50 brochures. This eye-catching brochure provides a quick, professional, effective overview of merchant benefits with the Localvantia program (see the brochure’s text below). It and the similarly designed Rewardical brochure (sold separately) should be accompanied by a merchant “close letter,” generated for you--with the Merchant's invitation code attached--at the SFI Affiliate Center. NOTE: Our system attaches the Merchant ID to you, the referrer. So when the merchant uses the invitation code in the close letter, you'll get credited. Learn more about creating and printing your merchant letters HERE. TIP: All three items--your Localvantia and Rewardical brochures, as well as the merchant close letter--will fit perfectly into the matching Localvantia window envelopes available HERE. 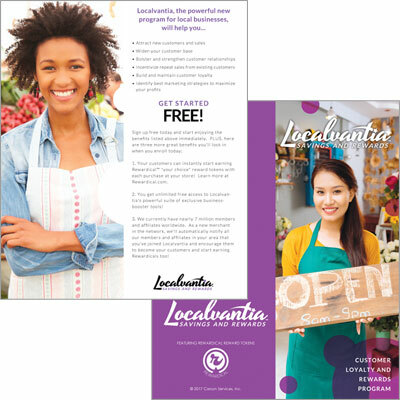 BROCHURE TEXT: Localvantia, the powerful new program for local businesses, will help you... • Attract new customers and sales • Widen your customer base • Bolster and strengthen customer relationships • Incentivize repeat sales from existing customers • Build and maintain customer loyalty • Identify best marketing strategies to maximize your profits GET STARTED FREE! Sign up free today and start enjoying the benefits listed above immediately. PLUS, here are three more great benefits you'll lock in when you enroll today: 1. Your customers can instantly start earning Rewardical™ "your choice" reward tokens with each purchase at your store! Learn more at Rewardical.com. 2. You get unlimited free access to Localvantia’s powerful suite of exclusive business booster tools! 3. We currently have nearly 7 million members and affiliates worldwide. As a new merchant in the network, we’ll automatically notify all our members and affiliates in your area that you’ve joined Localvantia and encourage them to become your customers and start earning Rewardicals too! The Localvantia Merchant Bifold Brochure is a professional, full-color, classic “bi-fold” brochure designed for use with your pre-registered Localvantia Merchants. They are printed on 100 lb. glossy 6" x 8.5" stock, two-sided, then folded in half vertically to 3" x 8.5" to fit perfectly in a standard business envelope. Each unit ordered includes 50 brochures. This eye-catching brochure provides a quick, professional, effective overview of merchant benefits with the Localvantia program (see the brochure’s text below). It and the similarly designed Rewardical brochure (sold separately) should be accompanied by a merchant “close letter,” generated for you--with the Merchant's invitation code attached--at the SFI Affiliate Center. NOTE: Our system attaches the Merchant ID to you, the referrer. So when the merchant uses the invitation code in the close letter, you'll get credited. Learn more about creating and printing your merchant letters HERE. TIP: All three items--your Localvantia and Rewardical brochures, as well as the merchant close letter--will fit perfectly into the matching Localvantia window envelopes available HERE. 1. Your customers can instantly start earning Rewardical™ "your choice" reward tokens with each purchase at your store! Learn more at Rewardical.com. 2. You get unlimited free access to Localvantia’s powerful suite of exclusive business booster tools! 3. We currently have nearly 7 million members and affiliates worldwide. As a new merchant in the network, we’ll automatically notify all our members and affiliates in your area that you’ve joined Localvantia and encourage them to become your customers and start earning Rewardicals too!